Was ever a plant so well named? 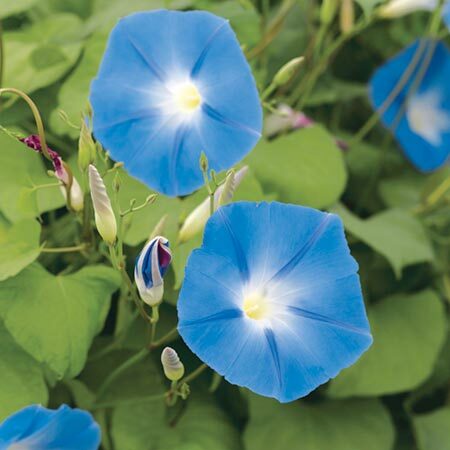 These vibrant blue trumpet-shaped flowers on a hot summers day are simply enchanting. Climbing. Often wrongly confused with the convolvulus (Bindweed) that causes us such trouble in the garden. These ipomoea are annual types, so you are not plagued with those creeping roots for evermore! These are climbers, ideal for a sunny wall or fence or in the conservatory. RHS Award of Garden Merit winner. HHA - Half-hardy annual. Seeds/plants harmful if eaten. Sow February-April to flower July-September. Suggested planting distance 15cm (6"). Ideal climber. Attractive to bees. Drought tolerant. Suitable for glasshouse or conservatory. Prefers full sun.